Sony uncovered its PlayStation Vita at the E3 expo in Los Angeles, the company's next-gen portable entertainment system with a 5" OLED screen and a multi-touch pad on the rear. 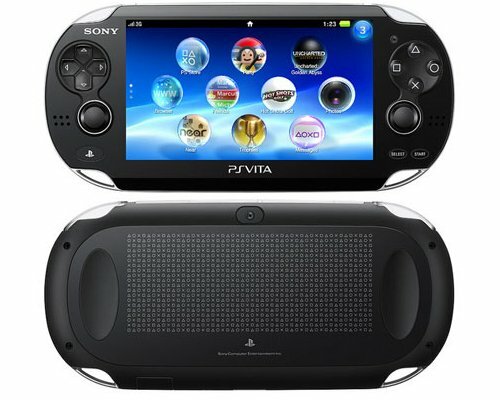 Sony Computer Entertainment Inc. (SCE) today announced PlayStation®Vita (PS Vita) (PCH-1000 series) as the official platform name for the next generation portable entertainment system (codename: NGP). Wi-Fi model will be available for 24,980 yen (including tax) in Japan, $249 in US and €249 in Europe, 3G/Wi-Fi model will be available for 29,980 yen (including tax) in Japan, $299 in US and €299 in Europe and successively launch in global market starting the end of 2011. "Vita", which means "Life" in Latin, was chosen as the most appropriate name for the next generation portable entertainment system as it enables a revolutionary combination of rich gaming and social connectivity within a real world context. SCE is aiming to transform every aspect of user's daily life into an entertainment experience. PS Vita incorporates a beautiful 5-inch multi-touch organic light emitting diode (OLED) as the front display and a unique multi-touch pad on the rear. Together with the front touch screen and the rear touch pad, PS Vita offers new game play experiences never before seen on any device, allowing users to interact directly with games in three dimension-like motion, through "touch, grab, trace, push and pull" finger motions. Also PS Vita features two analog sticks which enable a wider range of game genres to be brought into the portable experience, such as shooters, action games, and fighting games. Exciting and attractive new titles*1 are scheduled to be released from SCE Worldwide Studios, including "GRAVITY DAZE", "Uncharted Golden Abyss", "Little Deviants", "Hot Shots Golf", "Reality Fighter", "Hustle Kings", "ModNation Racers", "Wipeout 2048" and "Super Stardust Delta," as well as from a broad range of third party game developers and publishers, which will deliver value only possible on PS Vita. Also, by having both Wi-Fi and 3G network connectivity, together with various applications, PS Vita will enable infinite possibilities for users to "encounter," "connect," "discover," "share" and "play" with friends wherever they are. On January 27, 2011, SCE announced the first PS Vita application, "near", which will come pre-installed. It will let users discover what games PS Vita users in the vicinity are or were recently playing, as well as let users share their game information. "near" also enables location-based gaming features such as "gifting," in which a user can access virtual game-related items that other users are sharing, through checking in at geographic locations that others have also visited. The virtual items can include content unlocked from games, such as character costumes, weapons, and treasures. Sharing these items between users adds a unique dimension to the portable gaming experience on PS Vita while enhancing the social connectivity among the PS Vita community. Additionally, PS Vita will come pre-installed with a newly developed application called "Party." "Party" is an innovative application for a portable entertainment system which enables users to enjoy voice chat or text chat not only during online gaming, but also when users are playing different games or using different applications such as internet browser. Through "Party", which offers a new form of social networking, and "near", which enables users to share their game information with other users anywhere, anytime, users can dramatically expand the boundaries of interactive communication. Also a tutorial application called "Welcome Park," developed specifically to guide every user about PS Vita's brand new user interface such as the front touch display and the multi-touch pad on the rear, will come pre-installed. By playing "Welcome Park", users can easily become accustomed to the three dimension-like finger motions used on PS Vita.